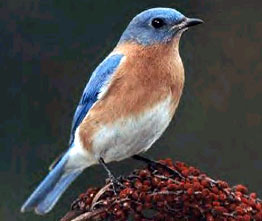 The Eastern bluebird (Sialia sialis) prefers to inhabit open fields or grassy areas scattered with trees; such as field edges, hedgerows, or roadsides. This species can be found anywhere east of the Rocky Mountains all the way to the Atlantic coast. Although bluebirds are not as prevalent in the northeast as they were in the early 1900's, they are beginning to make a comeback. 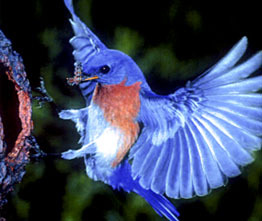 The Eastern bluebird was once a common species along the east coast of the United States. But due to habitat loss and the introduction of aggressive non-native birds, such as the House sparrow, the bluebird population dwindled from mid-1930 through the 1970's. Since the 1970's, bluebird enthusiasts have built and monitored bluebird trails and the population steadily increased. 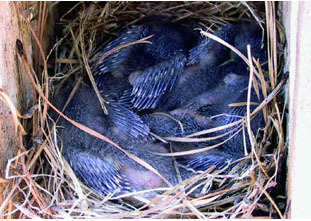 Bluebirds are now nesting successfully in areas where they had been missing for 25 years. competes with bluebirds for nest boxes. 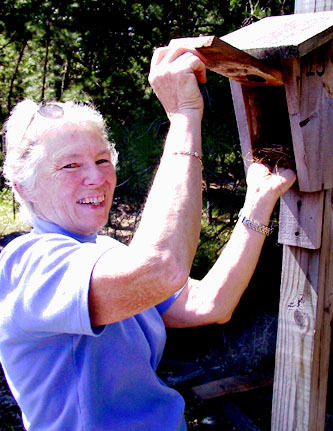 NJFS volunteer Laura Stone monitors the Bluebird Trail at the Forest Resource Education Center. Through the spring and summer, she diligently monitors 39 nest boxes. Laura records the number of nests, eggs, young, and fledglings in each box. She sometimes encounters more than birds - everything from blowflies and wasps to snakes and bats have been found in the nest boxes. Despite these obstacles you will find Laura at the FREC once a week, clipboard in hand, cautiously opening each box.